In March 1851, Congress passed a new law, effective July 1 of that year, reducing the rates of postage. The firm of Toppan, Carpenter, Casilear & Co. was awarded the contract for the printing of the new stamps required by the changed rates. These consisted of three denominations: One Cent, Three Cents and Twelve Cents. In addition to the opportunities for research afforded by this issue, the One Cent blue also presents a fascinating study of the effect that identification can have on value and detection of alteration. In this leaflet we will consider each type of the One Cent stamp, the expertizing challenges it offers and some of the patterns that emerge from the thousands of submissions that have been passed on by the experts. The One Cent stamp is by far the most elaborately categorized of all 19th Century stamps. Furthermore, where other 19th Century stamps are classified by many factors – such as color, type of paper, absence or presence of grill and the size thereof, absence or presence of perforations and the gauge thereof, and design variations – the classification of the One Cent stamp is based entirely on the last two factors – the existence or not of perforations and variations in the design. The most fundamental distinction in One Cent stamp analysis is between the imperforate 1851 issue and the perf 15 1857 issue. This distinction not infrequently becomes paramount in expertization, as, for example, when perforations are cut off of an 1857 perforated stamp to try to simulate fraudulently an 1851 imperforate stamp. Within each half of this basic division of imperforate-perforated stamps, there is an elaborate classification by design variations. 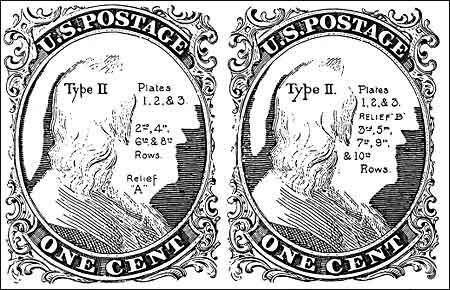 No other nineteenth century U.S. stamp has been classified in such detail on the basis of design differences. It is the proper classification of these design categories which gives the greatest trouble to collectors. Before proceeding to a summary explanation of these design types, mention should be made of the One Cent 1875 emission. Referred to in the Scott U.S. Specialized as a “reprint,” this item is in the same general design as the One Cent stamp but was issued as part of the 1876 Centennial Exposition fifteen years after the One Cent stamp had been demonetized in 1861. 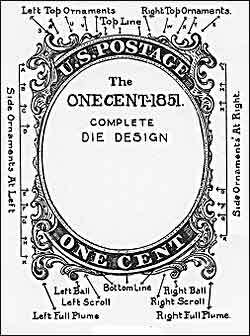 It was issued to show the One Cent design as it had been used at an earlier time, and was never valid for postage. This item was issued in perf 12 form, a gauge never used for the issued stamp. 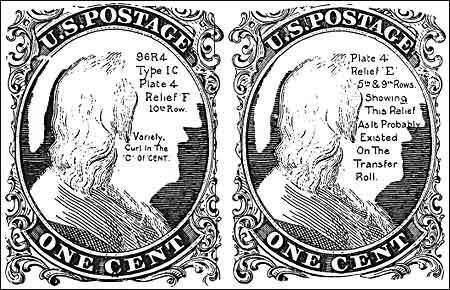 It was issued without gum, unlike the earlier postage stamps, and from newly manufactured plates made up entirely of the Type I (complete) One Cent design. These characteristics distinguish this 1875 item from earlier, regularly issued One Cent stamps. Thus this 1875 item is actually an officially authorized facsimile rather than a reprint. Nevertheless, it sometimes intrudes into the expertization and analysis of genuinely issued stamps, and must be considered in any review of the One Cent stamp. The purpose of this alteration was to provide more space for vertical rows of perforations. Another contributing factor to the multiplicity of types is the elaborate, baroque character of the design, which incorporated many separately identifiable components at its borders. Thus, when the trimming at the borders occurred, the deletion of separate design elements could be identified, rather than, e.g., merely a shortening of a uniform border area. This brings us to the review of the One Cent design types. The Imperforate Type 1, Scott #5, comes only from position 7R (right) in the early state of Plate 1 (“7RIE”). 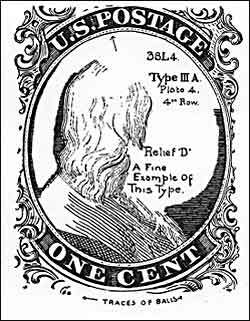 No other imperforate One Cent stamp is Type I. This is the rarest and most valuable imperforate One Cent stamp. Figure 2 is a diagram of this position. As can be seen from Figure 2, 7RIE has a distinctive double transfer which is evidenced principally in its upper ornaments and the “OS” of POSTAGE. Misidentifications of Scott #5 include examples of position 7R from the late state of Plate 1 (“7R 1 L “) – these stamps show the same characteristic double transfer, but the bottom ornaments are not complete and the bottom line is recut creating a Type IV position. Other misidentifications of 7R 1 E are made from imperforate proofs or perf trimmed copies of the perforated Type I or the 1875 facsimile, none of which exhibit the 7RlE double transfer. The perforated Type I comes only from Plate 12. In addition to lacking the distinctive 7R 1 E double transfer, Plate 12 Type I stamps have a secret mark in the form of a dot at the left center of the colorless oval surrounding the vignette. Although classified as Type I, these Plate 12 stamps lack the top line of ornament “S” in the upper left corner. See Figures 1 and 3. The secret mark dot is not a key to a specific type because it is found on all stamps printed from Plates 11 and 12, which include principally Types II and IlIa, as well as Type I. 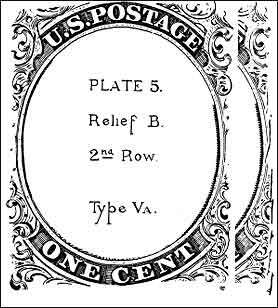 Although far from plentiful, perforated Type I stamps come from 99 of the 200 positions on Plate 12, a plate which came into use in early 1861 and which produced a number of remainders when the issue was demonetized in August 1861. Scott #18 is still affordable by the average collector whereas Scott #5, 7RIE, remains the premier imperforate rarity, with less than 100 copies recorded on or off cover. Several perforated Type I positions on Plate 12 have had their top ornaments substantially reduced by erasure or burnishing on the plate, thereby creating design variations within the Type I category of considerable interest to specialists. These variations do not fit within the traditional types of the One Cent classification. Finally, the facsimile design, Scott #40, although also within the Type I category, lacks several fine lines at top and bottom. See Figure 4. The absence of these few lines, however, does not preclude the facsimiles from being classified as Type I. Most proofs which are mistaken for Scott #5 are from the facsimile. All of the other types of the One Cent stamp involve substantial deletions from some part of the full design as shown on Figure 1. We describe this type before Type la because this type is more closely related in plate position and origin to the imperforate Type I, 7R I E. Type Ib stamps show the complete design at top and most but not all of the design at bottom. Type Ib stamps were produced from the positions surrounding 7R I E, that is, from positions 3,4,5,6,8 and 9R1E. Each of these positions was originally a full Type I design like 7R1E, but had some of its bottom ornaments burnished off after entry on the plate. Because positions 6 and 8 had less of their bottom ornaments erased than the other Type Ib positions, they are more highly prized within the Type Ib category. Figure 5 is a diagram of 8R1E, the best Type Ib example. Type Ib positions are difficult for the average collector to identify when the bottom of the stamp is cut close or into the design. 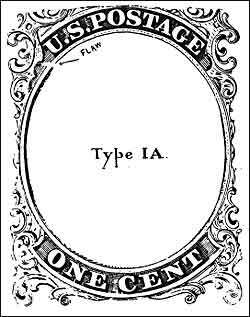 It should be noted that Type Ib comes only imperforate, the only major One Cent type with this characteristic. This type, the converse of Type Ib, shows the full bottom ornaments and substantially reduced top ornaments. See Figure 6. The little flaw under the “U” of “U.S.” is exaggerated in the diagram. It exists not only on all Type la stamps, but also on some other types, making it a necessary, but not certain, key to Type la identification. Type la comes only from 18 of the 20 positions on the bottom row of Plate 4, a relatively scarce plate which came into use in early 1857 just before the advent of perforations. Plate 4 continued in use to an even greater extent for perforated than imperf production. Type la is therefore known imperforate (Scott #6) and perforated (Scott # 19), but is much more rare imperforate. However, because of the difficulties experienced in the earliest perforated stamp manufacture, perforated copies of the la in which the design is not impinged upon by the perforations are the rarest of all Type la stamps. This type, although recognized by Ashbrook and generally recognized by the collecting community, was not listed in Scott until 1993. It is similar to Type la, but with the bottom right plume and ball incomplete. Two of the 20 bottom row positions on Plate 4 have partially erased right ornaments and are Type Ic, the remaining 18 positions being Type la, as noted above. See Figure 7A for a diagram of one of these positions, 96R4. This category is complicated by the fact that some 6 to 8 positions in the body of Plate 4, above the bottom row, also exhibit substantially complete left plumes and partially erased right plumes and thus qualify for Type Ic status; however, these 6 to 8 positions were made from a relief design which normally produced Type III and IlIa stamps rather than Type la. Thus, that relief design is different from the one used on the bottom row of the plate. See Figure 7B. This creates a distinction for One Cent specialists within this Type Ic category between the bottom row Type Ic’s and those from the body of Plate 4. The former are generally considered more desirable. Simply stated, on this type the bottom plumes and balls are missing. See Figure 8. This definition, however, embraces significant design differences within the Type II category. For example, on most Type II positions the top ornaments are partially erased, but on a few Type II positions, specifically those from the top row of Plate 4 (imperf and perforated) and the top rows of the Plates II and 12 (perforated only), the top ornaments are complete. Specialists prize these positions above ordinary Type II positions. Also, Type II stamps from the rare Plate 3 (which was issued imperf only) often have an exceptionally deep, rich color, and a number of Plate 3 positions show fine crack lines. These, too, are more highly valued than the ordinary Type II stamps. Finally, although Plate I Late produced recut (Type IV) stamps from 199 of its 200 positions, one position – 4Rl L – was not recut: this is a Type II (altered from Type Ib in the early state of the Plate) which has a distinctive double transfer and is worth much more than an ordinary Type II. It comes both imperforate and perforated. The latter, as in the case of Type IV stamps, is the rarer variety. These two reliefs, shown in Figure 8A and Figure 8B, were used on all positions on Plates I, II and III below the top row of each plate. Thus, these two reliefs are the most frequently encountered imperforate forms of Type II. It may be noted that Type II Relief B (right) shows almost complete ornaments, while the top ornaments in Relief A (left) are more reduced. This difference does not preclude both designs from being classified as Type II. Neither is considered more desirable than the other. On this type, the key characteristic is that both the top and bottom lines are broken; in addition, the top and bottom ornaments are always incomplete. The best and most highly prized example of Type III is position 99R2, which is distinctive not only for the wide breaks in its top and bottom lines, but also for the enormous double transfer along its right side. See Figure 9. Position 99R2 is lumped in as Type III along with more common examples of the type (described below). Nonetheless, 99R2 occupies a unique and important position within the One Cent classification system. Though lacking a separate number, it is given a specially paragraphed listing in the Scott Specialized as if it were a separate catalog number in itself. 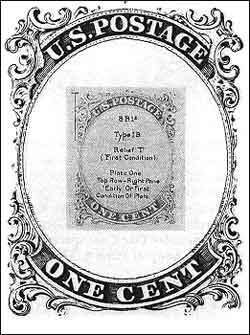 It is the second most valuable imperforate type variety (next to 7RIE, Type I) and the most rare and valuable perforated One Cent variety, all of which makes it a tempting target for both innocent and intentional misidentification. Other examples of Type III come from Plate 4. These were produced from approximately 37 to 65 of the 200 positions on this plate. The exact number of positions varies this much because, although all Plate 4 positions except those on the top row had clear top line breaks, many of them in rows 2 through 9 had very weak, shallowly engraved bottom lines which disappeared as the plate wore during its use. When one of these bottom lines shows a discernible break, the position changes from Type IIIA to Type III. Not infrequently, the engraving at the bottom is so delicate that the question of whether the bottom line shows a discernible break is open to reasonable dispute. Although this type is defined as having either the top or bottom lines broken, but not both, this, again, is a somewhat misleading definition. Almost all Type IlIA stamps show a broken top line. Only a handful of very rare positions show a broken bottom line and a complete top line. Indeed, such stamps are far more rare than any Type III. These bottom line breaks are specialist items and beyond the scope of this brief review. The ordinary top-line-break Type IlIA’s in imperforate form come from Plates 1 Early and 4. Those from Plate 4 all have clearly defined top line breaks. Figure 11 shows a typical Plate 4 Type IlIA. Type IlIa’s from Plate 1 Early do not generally show wide top line breaks. Some Plate 1 Early Type IlIa’s resulted from light transferring of the top line on Relief A positions – the relief that had significantly reduced top ornaments (see Figure 8) – followed by plate wear. Thus, some Plate 1 Early positions may be Type II in early printings and Type IIIA later – similar to the bottom line Type IIIA-Type III problem on Plate 4, referred to earlier. Perforated Type IIIA’s come from Plate 4, which, as previously noted, was issued in both imperforate and perforated form and from the perforated-only Plates 11 and 12. It will be recalled that stamps from Plates II and 12 can be distinguished by the presence of the dot-secret mark at the left center of the colorless vignette frame. When Plate 1 was reworked from its early to its late state, both the top and bottom lines were very lightly transferred on almost all positions and needed to be strengthened. Accordingly, as mentioned above, 199 of the 200 positions on Plate I in its late state had some recutting at either top or bottom or both. Any recutting, in whatever degree, qualifies a stamp as Type IV. 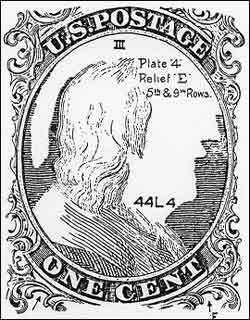 Since Plate 1 Late was used more than any other plate for imperforate One Cent production, Scott #9 is the most common imperforate One Cent stamp. Type IV stamps are subclassified according to the number of lines recut. Among the 199 recut positions, there were various recuttings of one or more of four lines: (1) the top outer line; (2) the top inner line, i. e., the top center of the “U .S. 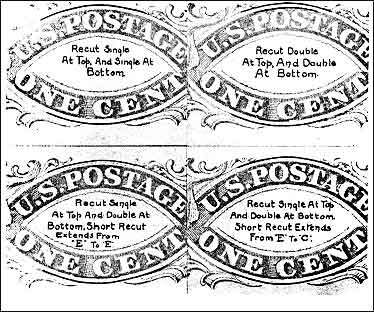 POSTAGE” label; (3) the bottom outer line; and (4) the bottom inner line, i.e., the bottom center of the “ONE CENT” label. The most common recutting, occurring on 113 of the 199 positions, was simply of the top and bottom outer lines – once at top and once at bottom. The rarest recutting, only two positions, was of two lines at top and two at bottom. In between, various positions show a number of possible recut variations – outer at top only, outer line at top and two at bottom, outer line at bottom only, twice at bottom only, and outer line at bottom and twice at top. See Figure 12 for diagrams of four typical recuts. In no case was an inner line recut without the adjoining outer line being recut as well. Especially prized by specialists are se-tenant pairs or multiples of position 4R I L, the only Plate I Late Type II, together with any of its surrounding Type IV neighbors, 3, 5 or 14RIL. Although Type IV stamps can usually be distinguished easily by the strengthened recut lines, which show darker than other lines in the design, there are some Plate 1 Late printings, which were made when the plate was new or freshly cleaned, in which the impression is so good overall as to make the recut lines blend in with the rest of the design. Such stamps are difficult to distinguish from the slightly more valuable Type II, which Type IV resembles except for the recutting. Plate I Late was used, but only very little, for perforated production, making perforated Type IV stamps far more valuable than imperforate examples. The motivation for fake perforating thus arises. See Part II below for the experience of the Foundation experts in this respect. The most common of all One Cent types is Type V, which comes only in perforated form and is characterized by having partially erased side ornaments. The plates from which these stamps were produced were manufactured from a six-relief transfer roll, with each relief distinguishable by its unique characteristics, but all having the common characteristic of reduced side ornaments. Three of the six Type V reliefs had uneven vertical lines of color along their shortened side ornaments, known as “side scratches.” Accordingly, . 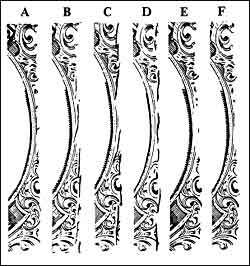 about one-half of all Type V stamps exhibit these marks, as shown in Figure 13.
on Reliefs B, C, and D.
The right side ornaments of the six Type V Reliefs, showing consistent “side scratches” on Reliefs B, C, and D. The side scratches add nothing to the value of a #24; beginners sometimes are misled by their appearance into thinking these are examples of valuable cracked plates, which they are not. 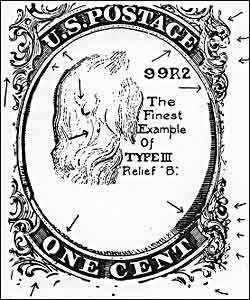 Early in the study of the One Cent stamp, these Type V stamps were classified as Type III because the top and bottom of all six reliefs have broken outer lines, as in Type III. However, under the modern and more appropriate classification, the truncated side ornaments distinguish the common Type V’s from the rare and valuable perforated Type Ill’s. Type Va should logically be described before Type V because the former is clearly the forerunner of the latter. Type Va stamps show the same six reliefs as on Type V, but in each case with more complete side ornaments. Type Va can generally be distinguished by the presence of the full curves on ornaments M, N and/or R. (See Figure 1.) Figure 14 shows a comparison of a Type V and Va from the same relief, in this case, Relief B. Type Va stamps never show side scratches. However, the extent to which the side ornaments of Type Va stamps are reduced varies greatly among the various Plate 5 positions, apparently because of considerable erasure on various positions after entry on the plate. Type V along horizontal rows. Although Type Va enjoys no separate Scott catalog number, a sublisting under #24 specially identifies Plate 5 stamps regardless of whether Type V or Va. Type V stamps from Plate 5 can only be identified by advanced specialists who are expert in plating. Normally a premium attaches to the Type Va stamps only. With a classification so complex as to require such an elaborate description even for an introductory overview, the reader will easily understand that many of the more difficult patients considered by the Foundation involve the One Cent stamp. Using this introduction as a basis, we now look at some summary data on the work of the Expert Committee in connection with the One Cent stamp. It should come as no surprise that the highest percentage of misidentification errors involves erroneous identification of the most valuable of the types, Scott #5. There appears to be no pattern in these misidentifications, with virtually all other imperf types (including #6) being submitted as #5. In most instances, misidentified #18’s actually are the more common Type II, Scott #20. In contrast, #40, the 1875 facsimile, when submitted with perforations intact, has not been mistaken for any other issue. Of the 50 stamps misidentified as Type la, 38 (or 17% of the total submitted) actually were Type IlIa. In many instances, these are IIIa stamps from the sixth row of Plate 4, which, like the Type la stamps from the bottom row, show the relief flaw under the “U” of “U.S.” On the other hand, very few Type la’s were misidentified as the less valuable IIIa’s. Very few Type Ib’s were misidentified as Type I. On the other hand, 19% of all stamps submitted as Type Ib actually were misidentified cheaper stamps. Most Type Ic’s that came into the Foundation were submitted as other numbers, usually the Type la (imperforate, #8A, or perf 15, #19). *The “Chicago perfs” are imperforate One Cent and Three Cents stamps of the 1851 issue, which were unofficially perforated at an approximately 12.5 gauge. They are found used, generally from Chicago, during the latter part of 1856 and early 1857, before official government perforations, which were 15 gauge, came into general use. The history of the “Chicago perfs” can be found in J. Wagshal, “The Origin of the ‘Chicago Perfs,’ A Great Mystery Solved” in the Chronicle of the U.S. Classic Postal Issues 130:100 (May, 1986). Most “Chicago perfs” are found on the Three Cents denomination. Less than 20 “Chicago perf’ One Cent stamps (Type II and Type IV) have been recorded. Because Type II is one of the lower value types, it is often submitted as a more valuable type or altered to produce a fake. As can be seen from Table IV, the fakers find it hard to resist the temptation to create unused #7’s from used copies, a type of alteration which underscores the importance of expert certification. * Includes only stamps and covers submitted as Type III or IIIa. ** Type destroyed by perforation. *** Two examples of perforated 99R2 on cover have been recorded, but neither has been submitted to the Foundation. The tendency of submitters to hope for the best was never more evident than with these types. Among the misidentified stamps, 123 #8A’s were submitted as the more valuable #8 ‘s, but only 9 #8’s were misidentified by their submitters as the lower valued #8A ‘s. To the amateur faker, it appears simple to create a Type III or IlIa by erasing top and/or bottom lines from less valuable types, but there are ways for the experts to catch such fakery. A number of such attempts have been identified. The relatively low value of #9 used prompts the fakers to try to enhance its value through removing or lightening of cancellations or through faking of rare cancels. In 88 instances, or 9% of all off cover #9 submissions, the Foundation experts detected such efforts. Misidentified Type IV’s usually are determined to be the slightly more valuable Type II’s. The Type IV is one of the few One Cent blue types for which perforated stamps carry higher catalogue values than their imperforate counterparts. No doubt this is why a significant number of counterfeit perforations are noted. Of the 21 fake #23’s, 15 were found to be reperforated #9’s. Type V stamps present almost no problems. As can be seen above, only 3 of 526 submissions, or less than 1% of all stamps, turned out to be more expensive other types. Submitters to the Foundation are urged to consider this factor in determining whether a prospective patient merits expertizing. Finally, we note that not all One Cent positions have been plated. Despite the outstanding research and masterful publications which have been devoted to this issue in the past, more remains to be done. Hopefully, the result of this leaflet will be to encourage new students to take up the study of this fascinating stamp. 1. Over the years, an unfortunate ambiguity has developed in the nomenclature referring to the One Cent stamp, caused by the fact that the imperforate version was extant from 1851 through mid-1857 and the perforated version from 1857 to its demonetization in the second half of 1861. Thus, a reference to the “1851-57” One Cent stamp may be taken to mean only the imperforate version, which was issued during these seven years, or to both the imperforate and perforated varieties, which were issued in 1851 and 1857, respectively. As used here, the term is intended to have the latter meaning, i.e. 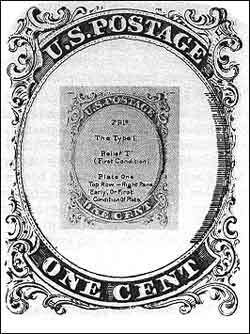 : the One Cent stamp issued during the 1851 through 1861 decade. 2. In February 1922, Ashbrook published The Types of The United States One Cent of 1851-1857. This was followed by The Type and Plates of the U.S. One Cent 1851-1857 (Scott Stamp & Coin, 1926). In 1938, his masterpiece was published, The United States One Cent Stamp of 1851-1857 (Lindquist 1938), Volumes 1 and 2. 3. Luff, The Postage Stamps of the United States (Scott Stamp & Coin, 1902). Luff recognized Types I, I I and IV substantially as they are defined today, but lumped Type V into Type III, and did not recognize Types la, Ib, IlIa or Va. This probably explains why the first three in this latter group had to be given subclassification type numbers ending in a small letter. 5. See, e.g., E. Oakley, “Some Observations on the 1851-60 United States One Cent Stamps From Plate One Late,” 58 Chronicle of the U.S. Classic Postal Issues 50 (May, 1968); J. Wagshal, “U.S. 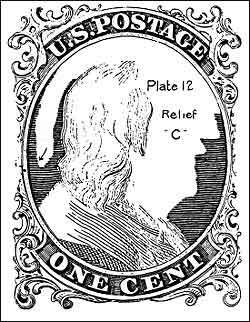 1-Cent Stamp of 1857: A New Look at Plate 5,” The American Philatelist, Vol. 84, No. 1 (January 1970); J. Wagshal, “The One Cent Stamp of 1851-57: A Reconsideration of Types I Through IlIa,” 1973 Congress Book 107. 6. Neinken, The United States One Cent Stamp of 1851 to 1861 (The U.S. Philatelic Classics Society, Inc., 1972) at p. 323. 7. From a card in the author’s possession. See also Ashbrook’s comments at p. 363, Vol. 2 of his 1938 work on the One Cent stamp, note 2, supra.